There were 13 kings during the Nguyen Dynasty, but due to political and economic reasons, only seven tombs were built: Gia Long Tomb, Minh Mang Tomb, Thieu Tri Tomb, Tu Duc Tomb, Dong Khanh Tomb, Duc Duc Tomb And Khai Dinh Tomb. Each tomb is built with its own architecture, in which Khai Dinh Tomb is the mausoleum that took time, effort and money the most. 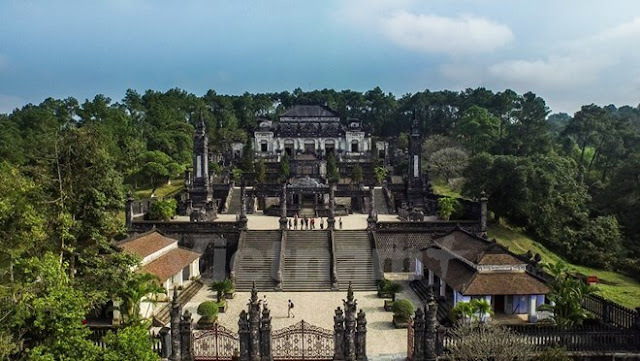 If you have the opportunity to travel to the ancient capital city, let’s stop to admire the beauty of Hue Khai Dinh Tomb to learn about the architecture of the tomb. Khai Dinh (1885-1925) was the 12th king of the Nguyen Dynasty, in position from 1916-1925. Of the 13 kings of the Nguyen Dynasty, Khai Dinh was the king known for the worst reputation. In addition to gambling, he is often criticized by contemporary newspapers for his flamboyant outfits, not adhering to ancient royal attire and makeup. Khai Dinh has 12 wives but only one son is Nguyen Phuc Vinh Thuy, King Bao Dai. According to many documents, having this child is not entirely formal. Because the king did not fond of femininity but favors Nguyen Dac Vong - a guard in the palace. Perhaps this is the reason that the tomb of King Khai Dinh more impressive than the tombs of the Nguyen kings. Khai Dinh's tomb becomes an indispensable sight in the two-day Hue tours of many travelers. With the viewpoint of the Confucian people and the philosophy of the Buddha, the kings of the Nguyen Dynasty built their mausoleums from the time they were alive. 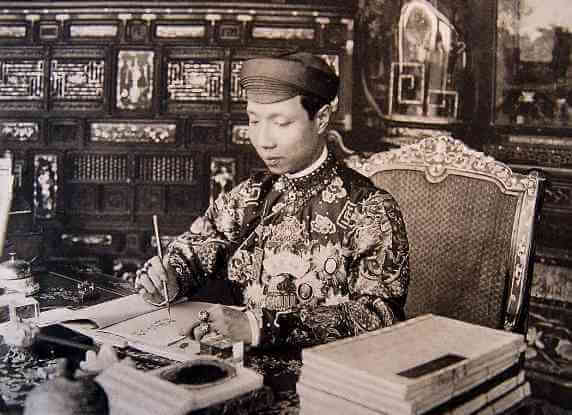 After taking the throne in 1916, Khai Dinh set out to find a place to rest. And Chau Chu Mountain (also known as Chau E), outside the Hue Citadel was chosen. In 1920, Khai Dinh Mausoleum was started but was under construction until 1925 when the king died. The construction of King Bao Dai continued until 1931 was completed. According to many records, for the money to build the mausoleum, King Khai Dinh asked the government to raise the tax to 30% and sent people to France, China and Japan to buy iron, steel, cement, porcelain , Colored glass ... Because of that, he was harshly condemned by history. Located on a fairly modest area, only about 117m × 48.5m but built with great meticulous and elaborate so the beauty of Khai Dinh Tombs are always praised by researchers and tourists. Like the tombs of the predecessor kings, Khai Dinh Tomb was planned according to the Eastern Feng Shui philosophy: in front of the tomb there is a low hill; the two mountains of Mount Chop Vung and Kim Son in front of the tomb are considered Blue dragon and White Tiger; Asian water flows in front of the mausoleum, from left to right is hydrous or also known as road; Chau Chau Mountain is behind. In addition, the king also changed the name Chau Chu Mountain to Ung Mountain and the tomb was named after the mountain - Ung Tomb. Khai Dinh built his mausoleum with the combination of modern Western architecture style with traditional Eastern architecture. This is also the only mausoleum that mixes East and West style. Located quite high, so visitors must pass 127 steps to visit this tomb. Most prominent in the Tomb of Khai Dinh is Thien Dinh Palace - where the king's body is placed. 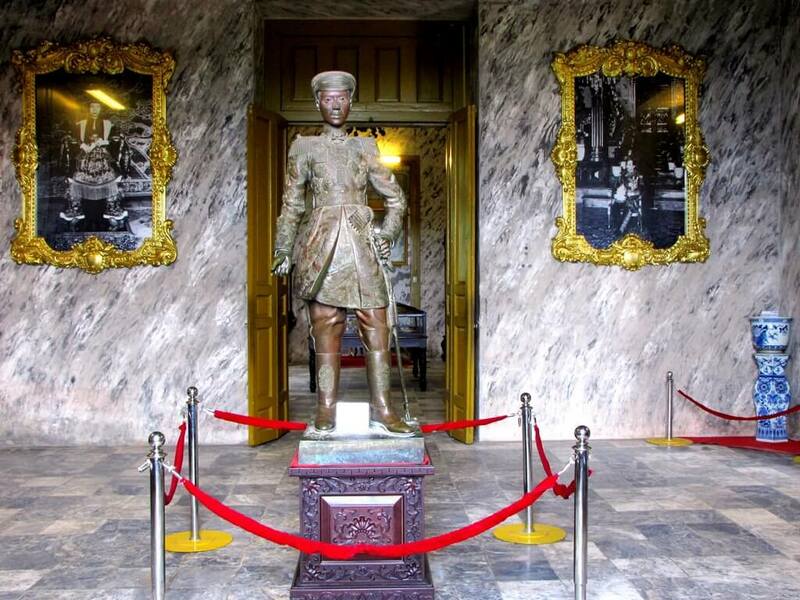 In the palace, there are two statues of Khai Dinh: a statue of the king dressed like a French soldier and ones in Vietnamese style, made in France. Especially, on the ceiling of the palace there are three large murals of “nine dragons in clouds” which is the largest in Vietnam by Phan Van Tanh. Another difference of the tomb of Khai Dinh compared to the tomb of the previous kings is: the location of the king's body in the other tombs are difficult to determine while it’s clear in the tomb of Khai Dinh. Due to the historical situation changes during the reign of King Khai Dinh and when he died, all actions of the Nguyen court were monitored by the French. Today, over 80 years, Khai Dinh Mausoleum’s original architecture is still quite intact. The beauty of Khai Dinh Mausoleum remains the subject of much discussion among researchers. However, there is a sad fact for this king that since he died, he has never received an incense stick from his child and grandchild.